This book in the popular Images of War series covers the deeds of the Waffen-SS on the Eastern Front during the Second World War. 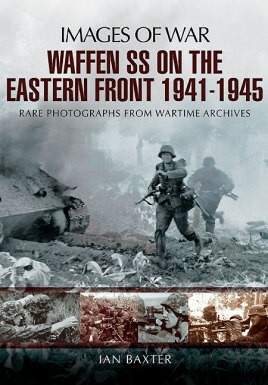 With extensive text and in-depth captions with many rare and unpublished photographs it is an absorbing analysis of the part they played on the Eastern Front. It reveals in detail how this elite band of men fought during the opening phase of Barbarossa, the invasion of Russia, how it supported and took part in the victory at Kharkov, Demyansk and other battles in the Soviet Union. The book reveals the Waffen-SS's role at Kursk and how it was forced to withdraw in the face of overwhelming enemy superiority and were rushed from one danger zone to another to plug gaps in the front. Often these troops faced an enemy ten-times their strength and it was for this reason they were feared and respected by their enemy. Although by early May 1945, the Waffen-SS was all but destroyed, having battled across half Russia and gone on to protect the withdrawals of the rest of the German Army to the very gates of Berlin.